Inspiration does not always come in the form of mysterious forces pushing images and urging actions from the creative side of the human brain. So much of what we do in all aspects of life is an advanced form of mimicry, as we apply past experiences to familiar aspects of a situation, or model our behavior from observing others. In the case of art, depicting the substance of our imagination must draw upon a pre-existing set of ideas about how to represent imagery experienced visually or in dreams. For most of us whom have grown up watching movies and TV, we often have dreams presented in a hazy light, sometimes even involving camera tricks such as rippling out of the clear focus of reality, or the characteristic sound of a harp escorting our senses to that other place where almost anything is possible. Similar tricks have been developed by painters to indicate a dreamy quality to images. During the Renaissance, as artists developed their craft - their skills often paralleled those of their master. This can be seen extremely clearly in the case of Raphael, whose mimicry of master Perugino was said to be so complete, that were it not for a signature, some of his pieces were indistinguishable from that of his master. When a stunning image is produced under these circumstances, if the work is unsigned, a great ambiguity develops as to the authorship of the work. In the absence of correlative documentation, all we have to go on are visual indicators - and this method of differentiation can be increasingly speculative rather than conclusive. The most famous of paintings whose authorship is in dispute is now known as The Pastoral Concert(c1508-09), currently housed in the Louvre. Whilst a variety of names have been proposed, there are two favourites: Tiziano Vecellio, known to us as Titian, and Giorgio Gasparini, dubbed Giorgione (Giorgio The Great) due to 'greatness of the stature of his mind' (as described by biographer Vasari). The Louvre catalogue now attributes the work to Titian, though this was not always the case. Looking at the problem from an evidential perspective, no definitive proof exists. The proclamation that Titian is responsible is a decision made by a group of art scholars based on their interpretation of the execution and style of the work. Young Titian's vision of the countryside is perhaps not as grand or poetic as that of Giorgione, however, what we can see are some wonderful use of colour. This painting can be seen at the The poetic theme very much rings true with that which Giorgione was famous for. It is known that Titian was asked to complete some of Giorgone's unfinished works after Giorgone passed away at age 33 due to plague in 1510. However, the 1509 completion date we are given seems to contradict this - though we are not sure of Giorgione's state in his final two years. That being said, this would not be Titian's only work which could be described as heavily Giorgionesque. As seen clearly with other artists, such the prodigious Raphael, mimicry of ones Master, and contemporaries was not at all uncommon. Life touching lips with Immortality. 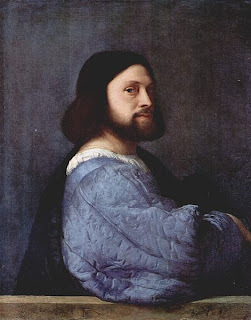 Titian himself was, even in his day, regarded as one of the greats of Italian painting, and the star of the impressive cadre of painters in Venice, commonly called The Venetian School. In fact, we are told that other painters often referred to him as "The Sun Amidst Small Stars", quoting a well known line from Dante's Commedia. An interesting aspect of this period of Venetian painting is the sense we have of a strong spirit of competition between the eminent Venetian artists, of which Giovanni Bellini, Giorgione, Titian and (slightly later) Tintoretto came to the fore. 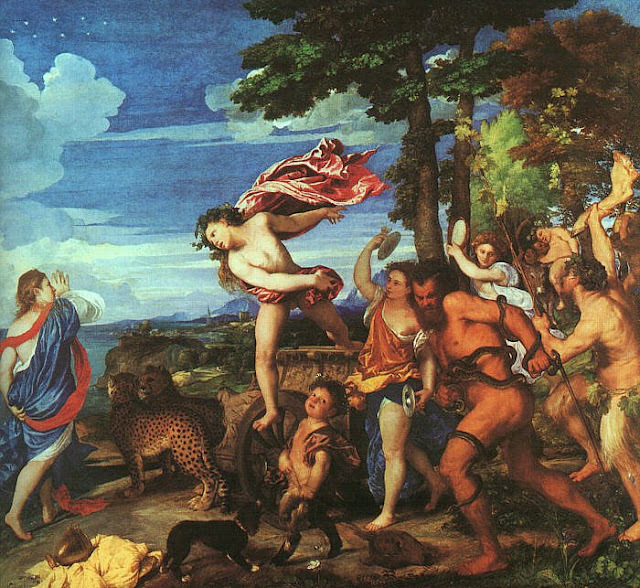 One of Titian's most well-known works is Bacchus and Ariadne, painted between 1523-24 and currently hanging at the National Gallery London. 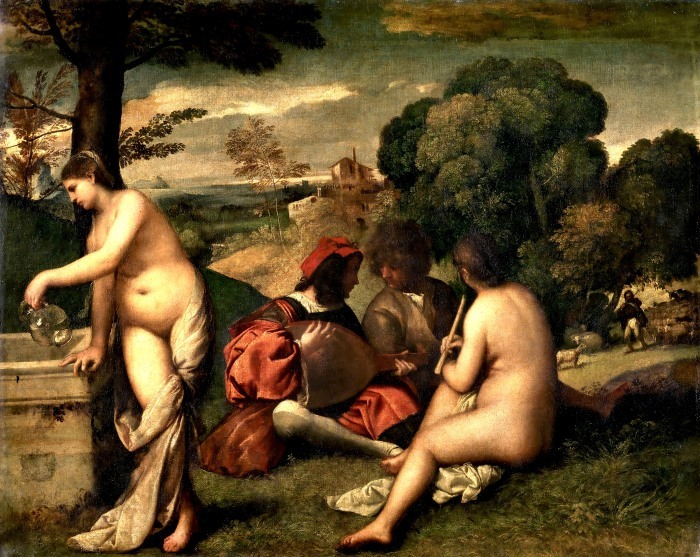 We can see that Titian has finally gotten past trying to emulate Giorgione's perspective of the landscape, but is now putting his own colorful gleam onto the landscape and figures within. You can read a lot about this painting, and how 'dynamic' the composition was - though some of these descriptions neglect to mention that Titian did not exactly come up with this himself. Bacchus' famous dynamic pose is actually derived from Raphael's Triumph of Galatea, a fresco executed by Raphael 11 years previously. 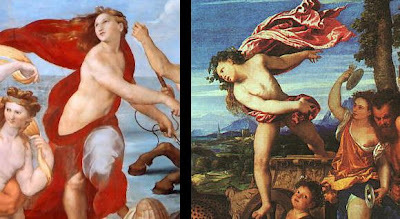 Raphael's The Triumph of Galatea(left) was a fresco painted in 1511 at the Villa Farnesina in Rome. What is special about The Pastoral Concert? 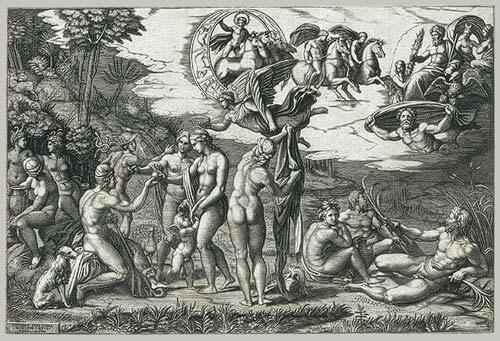 The dreamlike, ethereal haze that pervades the image was something unique to The Renaissance. The struggle to depict realism which so preoccupied earlier Renaissance artists has evolved to encompass the skewed realism of the mind. The two central figures are deliberately shown to not notice the lovely nudes - rather than jumping to conclusions about the homosexuality of this central pair, it is important to remember the tradition of symbolism, handed down from painters of antiquity, which eventually were to be organised into emblem books. Andrea Alciato's Emblematum Liber was the first published work which attempted to catalogue the symbological traditions of art, yet to perhaps fully explain the women in The Pastoral Concert, we need to look at one of the more ancient variations on the origins of inspiration. Arising from ancient Greece, the nine Muses were the more commonly known, which dates back to descriptions written by Hesiod (?8th Century BCE). Looking at the development of the concept of Muses, there was an original notion in Ancient Sources that there were 3 modes of inspiration, or a Muse triplet. It is feasible that the original triplet were expanded to nine as the arts became more well established in ancient Greece. Notable Roman statesman and scholar, Marcus Aurrentius Varro described the variations of three and nine Muses. Later author, Greek geographer and traveler Pausanias (2nd Century CE) also described the three original muses, but explained them in terms of practice, memory and song. As it is was not a subject of the finite sciences, writers and artists felt free to pick and choose which set to draw from. These Nine of course eventually expanded to included hundreds of representations of aspects of life beyond the arts, as described in the aforementioned emblem books. Keeping the Muse triplet in mind, one possible interpretation would be to see these muses in the Pastoral Concert, particularly the description one born from the movement of water, another who makes sound by the movement of air, and a third, who is embodied only in the human voice. Are these allegorical references to the Muse Triad? Some reports have also cited a resemblance of the central rustic figure to Giorgione himself. It is entertaining to imagine the figure on the left is Titian (see self portrait above), but like most things to do with this painting - can not be correlated with documentary evidence. 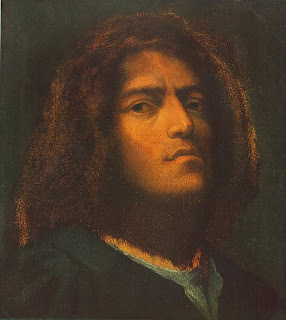 A Giorgione Self Portrait, currently at the Museum of Fine Arts in Budapest. The mystery of The Pastoral Concert's themes, as well as its creator, added to the mystique that surrounded this image, amplifying it through time. It was this allure which floored Dante Rossetti, driving him to rash poetry, and it was the same mystery that fueled the minds of artists looking to the future of a medium that was threatened by changes in public perception, and the advent of new technology. It is at this point we can introduce Edouard Manet to one of the throng entranced by this painting. 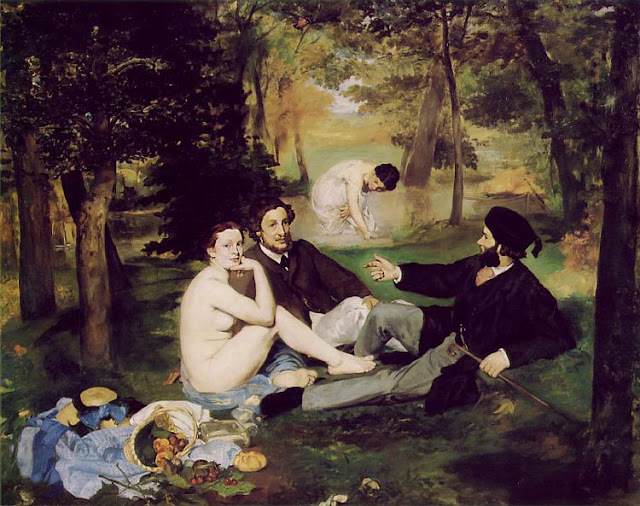 Adored by many, and heralded as one of the progenitors of the wildly popular French Impressionist style, Manet delivered us his own rendition of a country picnic, with the charged sexual undertones of The Tempest with Le Dejeuner Sur L'Herbe (The Luncheon on The Grass), painted between 1862-3. It can be be viewed at the Musee d'Orsay in Paris. The uneasiness this painting caused to many viewers at the time is a bit more difficult to grasp as a modern viewer. However, unraveling some of Manet's past, and exposing some of the new revised iconology of this painting makes it an ideal example of the portents of modern art and the impending doom for the poetic and decorative ideals of an artist such as Giorgione. Whilst Manet's Dejeuner seems to have captured the imagination of writers such as Emile Zola (whose fictional work The Masterpiece is inspired by this painting), and later artists such as Picasso, at an essential level is reminiscent of one of those kitsch paintings featuring unlikely characters in unlikely settings. This famous luncheon depicts some art/theatre students(or dandies) hamming it up, An unabashedly naked woman, and a lady in the stream urinating/bathing(depending on which interpretation you are comfortable with), all under the watchful eye of a bird, suspiciously positioned like The iconic 'Dove of Christ' that adorns so many Medieval and Renaissance works. Manet's compostion for Dejeuner was lifted directly from Marcantanio Raimondi's The Judgement of Paris(1515), which is stated to be originally designed by Raphael. Art critic and journalist Waldemar Januszcak has been mentioned in previous posts, and whilst many documentaries have been made about Manet and his impressionist cohorts, Januszczak's journey into the angst ridden Manet's mind will give you a candid, entertaining and somewhat disturbing introduction to the French Impressionists - something that you generally miss gawking at the poster perfect images of Degas' ballerinas or Claude Monet's Notre Dame. Dejeuner was entertainingly covered in an episode of Januszczak's wonderful short format series Every Painting Tells A Story, which can be purchased from ZCZ films. 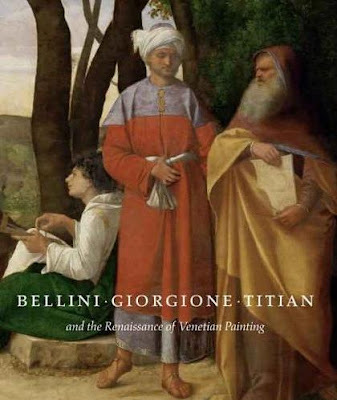 To explore the wonders of the Venetian Renaissance in Art, David Alan Brown's Bellini, Giorgone, Titian and The Renaissance of Venetian Painting is a thoroughly researched and wonderfully illustrated book. From the perspective of a modern viewer, it is easier to dismiss The Pastoral Concert as an idealised image, depicting a fantasy conjured from the floral mind of an artist with Poetic leanings. Whilst this is not an inaccurate description, it does not do the image justice. Like film and music, art should have the ability to transcend the boundaries of reality and imagination, and to appeal to those parts of us that constantly yearn for the wondrous and beautiful. In this sense, The Pastoral Concert is a tremendous achievement. This is a fascinating post and I like the way you relate the painting to Varro and the idea of the three muses. As an amateur guitarist, I'm also struck by the inclusion of a fourth (?) type of sound--that coming from the plucked strings of the lute. Made from both wood and sheep's gut, the lute is forged from elements of the pastoral landscape itself. When teaching this work, I tend to stress this nature-into-culture theme, since it seems to connect nicely to the craft of painting itself. Painters take the stuff of nature (raw materials), refine it (pigments, etc. ), and then (using their art) create new landscapes. That is an excellent point obridge! I was trying to not mix the Muse Triads, Varro seems to driving at the Titanid Three whereas the Lyre strings is specific to the Muse Daughters of Appollo or Musae Apollonides. That being said, we can't put it past Giorgione to include this re-imagining of the Lyre as lutenist - as Vasari describes Giorgione in his vite..
"He was brought up in Venice, and took unceasing delight in the joys of love; and the sound of the lute gave him marvellous pleasure, so that in his day he played and sang so divinely that he was often employed for that purpose at various musical assemblies and gatherings of noble persons." Unfortunately , the Giorgione attribution, whilst fantastic fuel for our imagination - is hard to prove.. from what I have encountered, the Titian attribution the Louvre have settled for is far from solid as well. The problem with interpretation, is that you'll generally try to find "one" meaning...I could easily find 50 different interpretations of this painting from very serious historians of art (see for example Egan, Klein, Calvesi, Motzkin, Brown, Rosand, Bardon etc...). The classical approach wishing to define "one" sense, ignores many contradictory elements and theses annoying the purpose of the demonstration. Saying that "it's not hard to imagine" proves nothing, nothing at all. I could make just as convincing links with various ancient texts and Renaissance texts, with many myths, but this painting, like many very special venitian paintings from G.Bellini, Giorgione or Titian, would be much more interesting if we now tend to look at it in an opposite way. Finding "meanings", let sense proliferate would be much more appropriate to better understand this polysemic kind of painting. you must read Françoise Bardon's books about Le Concert champêtre, you'll then discover a new point of view, a new approach to history of art...fantastic ! Hello Anon. Thanks for your comment! It is true, the complete meaning of this work will likely be forever obscured. I have indeed read Bardon's accounts. Although I wouldn't describe them as enthusiastically as you would, they are an equally important facet of the history of interpretation derived from such works. If someone ever did bother with an historiographic summary of the responses to the work, it would be vital to include it. thanks for replying to my message ! A wonderful exh. cat indeed! A shame more did not get to enjoy its content as it never made it into English (as far as I can tell). Thanks for your contributions anon... make sure you take a look at some of the newer posts too!